Tom and I lived in the Washington DC area for over a decade, so you think we’d be used to hot, humid summers. It’s only 83 degrees, normally an ideal summer temperature, but the air is saturated and there’s not a breath of wind — mosquito nirvana. I’ve taken two showers already today, and will need a third before I can drag my sodden self into bed. Dinner is still a necessity, especially with a teenaged eating machine athlete in the house. I had a nice piece of salmon and a half-dozen ears of freshly picked corn. For the corn, I resorted to the method recommended by our farmer’s market: Shuck the ears, wrap two or three of them in a soaking-wet dish towel, and microwave for 2-3 minutes per ear. Unconventional, perhaps, but it does result in tender kernels — and doesn’t heat up the kitchen. 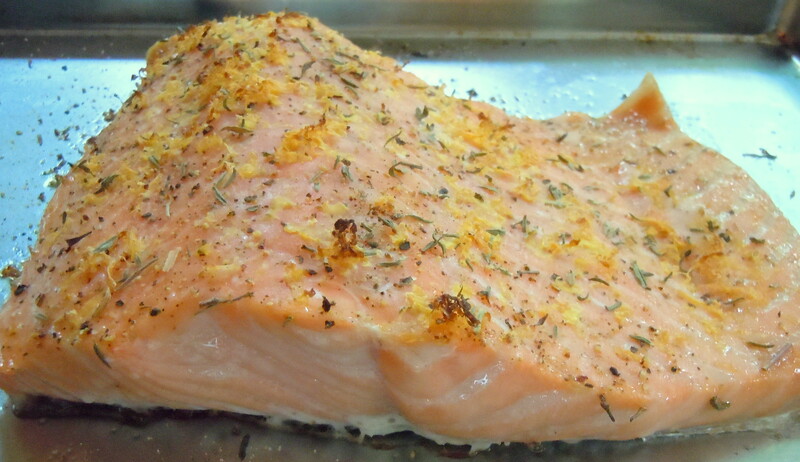 For the salmon, I opted for quick roasting in a hot oven, with minimal seasoning. On the side was my favorite accompaniment to heartier fish (tuna, salmon, trout): wasabi*cream. That hit of the wasabi’s sinus-clearing heat is nicely balanced by the cool sour cream. 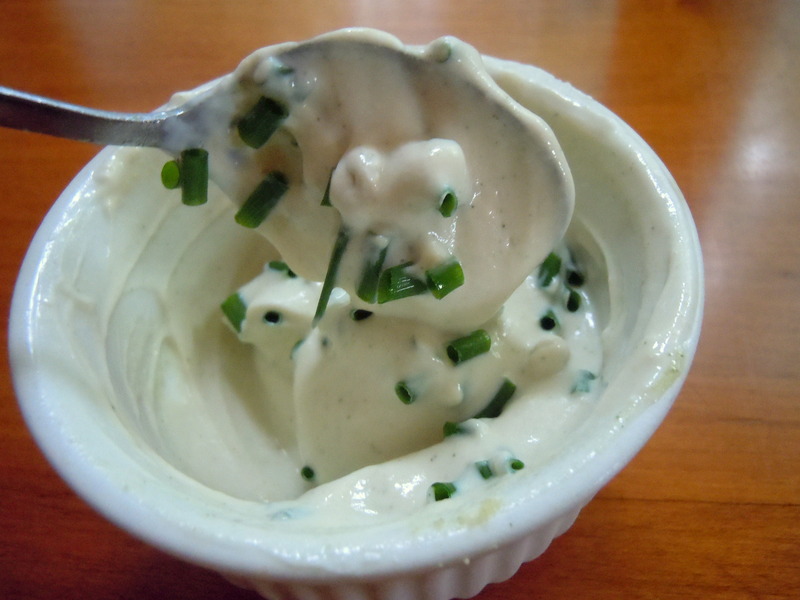 This sauce is also wonderful with roasted potatoes, steak, grilled chicken… you get the idea. *There are numerous sources for wasabi powder. I get mine at Penzey’s. I find you can control that fierce heat better with the powder than with the pre-mixed wasabi in a tube. Luke is an adventurous eater (and cook), but is not fond of salmon. In fact, the only seafood he’ll eat is calamari. Go figure. Since the house was currently devoid of squid, I browned some chicken-spinach sausages for him. 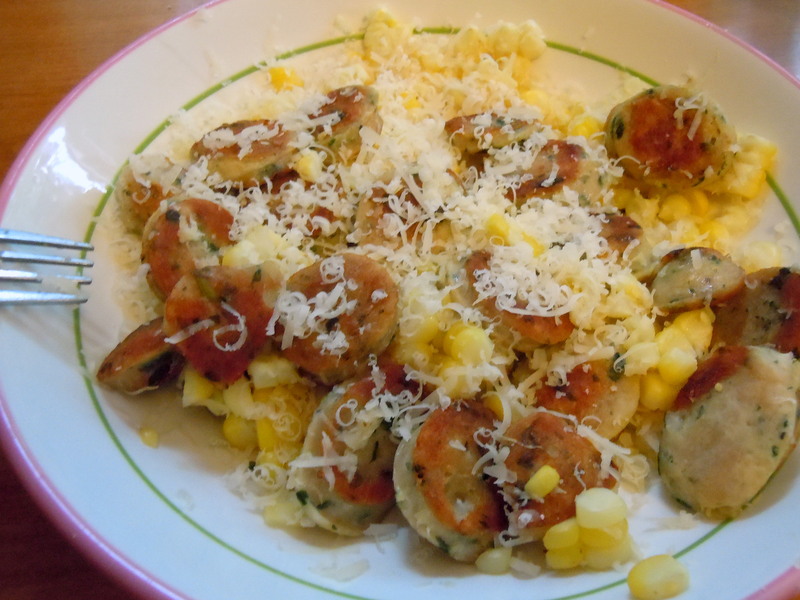 He cut the kernels off his corn, tossed them with the sliced sausage, and topped it with grated parmesan. Meanwhile, put the wasabi powder in a small bowl and sprinkle with the water and soy sauce. Let it sit for a few minutes to give the powder time to rehydrate, then stir in the sour cream. Add the chives, if you’ve got them. Serve the sauce on the side of the salmon. This entry was posted in main courses, meat, poultry,and fish and tagged fish, salmon, sour cream, wasabi. Bookmark the permalink. I wonder if horseradish would be good in the sour cream. I have a horseradish lover in the house. Ever done that? I do make a similar sauce when we have beef fondue, but it would be great with salmon as well. My guys aren’t fond of horseradish, but they don’t like wasabi either, and I manage to use that fairly often.